After almost 8 years of trudging around with my Rebel 300D, I finally decided it was time to replace one of the pioneers in DSLR land. The camera never really missed a beat, but just a wee bit of technology in this realm since the 300D sat on the shelves. After a few weeks hee-ing and haw-ing, I finally hit the order button on a Canon 6D early in January, and the second week of 2013, the goodie box arrived from the UPS man. A couple days later, on a cold, but wonderfully clear and snow-swept landscape day, the camera had a chance to visit the Union Pacific Nampa Sub. 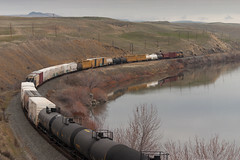 After the Z-train, I meandered eastward a bit to a spot a bit east of La Fleuer where the mainline is on a little tangent stretch, with the approach signal for Owyhee visible to my east. There was not a ton of snow around, but the wind had swept it into decent sized drifts, and also carved it into various smooth and gentle undulations. Thankfully though, there was little if any breeze as the temps hovered around the mid-teens. Next up would be an eastbound manifest, as the radio crackled about the Z train meeting one at Kuna. One of the neat things about this spot is that eastbounds are on a slight, but noticeable grade as they climb out of the Treasure Valley. By no means are they struggling, but a train with some tonnage will be noticeable to the ear from a distance, and this eastbound was heard for several minutes as he blew for the road crossing at Cloverdale and the three units up front (with two on the rear) made a run for the climb toward Orchard. 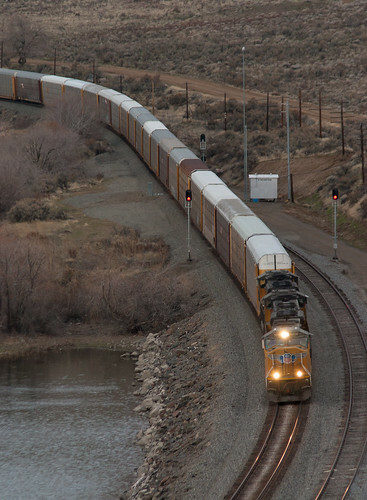 As I watched in the distance as the manifest rolled through Owyhee, and made the turn to the southeast to climb toward Orchard, the detector at MP443.1 to my west alerted me to another eastbound. 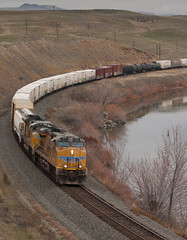 Not long thereafter, UP6829 came roaring down the tangent, only to kick it out near my location as the approach signal for Owyhee indicated this soda ash empty would have to take the hole and wait a bit for a meet. Things were quiet for a little bit, but then off in the distance a westbound rolled down toward Owyhee, and kicked the MP431.7 detector, having most likely met UP8639 east at Orchard. With the soda ash empties tucked away, UP7430 made decent time toward me, probably due to the MP15AC, UPY1453 helping out the GEVO on the point. Ok…so the switcher was dead-in-tow and not much use, it still made for a unique lash-up of power on the MROHK. 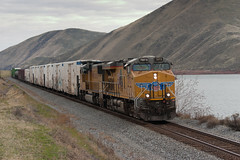 As the UP7430 cleared my location, UP6829 departed the siding at Owyhee at 15:15, getting up-to-speed and continuing eastward. The scanner again crackled, letting me know UP7430 would meet one at Kuna. Not a bad run here this afternoon ! For this eastbound, I decided to test out the video capabilities of the 6D. I had the Canon HV20 setup as a backup, and to record a different angle on video, and I am glad I did. Instead of crossing over into video mode, I instead went into Live-view mode, and while I thought I was videoing the wonderfully-smelling lumber train, nothing was stored for posterity for this event. Camera 1, me 0. Perhaps a bit shorter than usual, and maybe less power, but still a nice way to wrap-up the day. With the sun rapidly disappearing, I decided to call it a day and head for home to see what the captures of the day looked like. 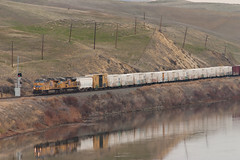 Thanks again to Adam Vogt and Robert Jenkins as we exchanged FYI’s view the Idaho Railfans Facebook group several times on the day. To see the sights from Bliss, 85 miles or so to my east, check out Adam’s video from the day. 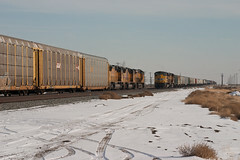 The sun was partially out, and even though temperatures have only been in the teens to low-20’s for a high the past few weeks, it seemed like a good time to head out, and catch some action along the Union Pacific with a bit of snow still clinging to the ground. I headed out around noon south of Boise, and as I neared the tracks, an eastbound rolled over the detector just east of Kuna, ID at MP443.1. I decided it was best to head further east to Orchard to try and catch the eastbound, although it might be a stretch if he was moving pretty well. I pulled in to Orchard around 13:40, and did not see anything on the horizon. 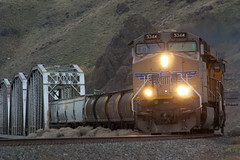 The scanner soon crackled and the eastbound had taken the hole at Owyhee to wait for a Z-train, well, at least he did not beat me here, and a westbound to boot ! Orchard has a couple of interesting tidbits. Most visible is the water tower that still stands from the steam days at the west end. I learned on the day from a local the tower is still used for the local community and surrounding ranches for water. 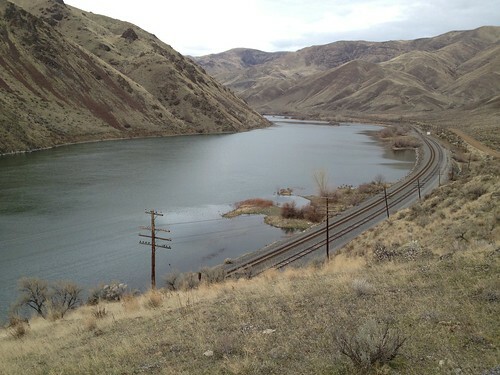 Also, the old passenger main to Boise cuts off from the freight main here as well, and although the line is no longer a through route, it is frequently used to store rail cars, and there is currently a collection of autoracks near Orchard, and a number of gondolas further east. Lastly, Orchard is roughly the summit of a mild climb coming out of the Treasure Valley for eastbounds. Nice tangents to the east and west of the road crossing allow ample warning of any approaching traffic — so — on to the action on the day. After the westbound cleared, a little while later, action picked up a bit. 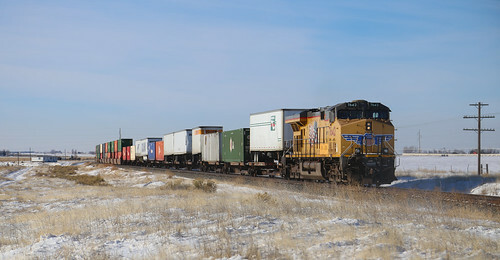 At 14:40, a westbound manifest pulled into the siding from the east end of Orchard, and soon headlights appeared to the west as the eastbound intermodal approached. As the westbound tucked into the siding, and the east end had a favorable indication, the eastbound intermodal picked up the pace and was on the move east again. A few minutes later, the west end of Orchard went green from the siding out to the main, and UP8636 notched up and started moving westward again. Things went quiet along the rails for an hour or so, but shortly before 4PM, as the sun rapidly began to disappear, headlights on an eastbound appeared on the horizon to the west. UP5655 approached and rolled through Orchard on the main at a nice clip with grain empties headed east, with the treat of a patched SP GE in the consist. Saturday, December 15, 2012 dawned, and I had a chance to escape trackside. As I loaded up the gear, the usual which direction to head question came up. Usually I head eastward somewhere, perhaps out around Kuna, or maybe toward Owyhee, or if the mood strikes, Orchard and further east toward Glenns Ferry. For some reason today, I felt the urge to head west somewhere, and decided to head toward Weiser, and check out the railroad from Weiser west to Cobb and Rock Island. The UP pretty much flirts with the Snake River just west of Parma, ID, crossing over into Oregon and back into Idaho, but west of Weiser, it picks up the Snake and runs along its banks for about twelve miles or so before it makes a hard left turn westward into Huntington, OR, saying goodbye to the Snake River for the last time. Along this stretch is Olds Ferry Road, a decent dirt road, shuttling folks to and from hunting and fishing destinations, off-road vehicle playland at the sand dunes, and/or Steck Park which happens to sit right at the east side of the bridge over the Snake. The road and topography vary a bit, either trackside, or rising up and down a bit, yielding a variety of views and angles for whatever the railroad and weather may bring, so the options here are fairly varied. 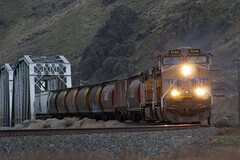 Trains do move along at a nice clip, so chasing is a bit difficult unless a meet occurs. The UP7187 east was quite a sight — the roar and rumble of the three motors up front, the smells of the various lumber cars, and the two DPU’s on the rear working to get the manifest back-up to track speed, all along the river, what a nice treat. After passing, I again worked my way westward, heading up into the canyon as the tracks and river turn from a westward direction toward the north. The canyon narrows in, and the road goes up and down, affording some nice vista’s over the river and tracks below. I setup at a spot near the west end of Rock Island siding, up about 100 or so feet above the tracks, and kicked back, and waited. After 45 minutes or so, and lunch, a westbound appeared. A little bit unusual, although not completely, is the mid-train DPU instead of on the rear, due to the numerous empty centerbeams and the makeup of the rest of the train. After a couple up on the hill, I wandered down toward the bridge over the Snake River at Steck Park. There are a number of different ways to work the bridge into a shot — today I decided to get closer, and pulled into the park and setup shop. Luckily, as the light was quickly fading away on the day, an eastbound manifest appeared, allowing for an obligatory train-rolling-across-the-bridge moment, cool ! While back in Chicago, did a quick afternoon jaunt before our flight out, and hit Chicagoland Hobby and Des Plaines Hobbies. Prices…eh…not great, nothing like the local Model Train Warehouse, but I was not really looking to stock up on rolling stock for the staging yard. I did pickup a couple of Diesel Era’s (May/June 2006 and July/August 2006). There is a two-part series on the Santa Fe SD40-2’s that I enjoyed, and will serve as good reference for some N Scale Kato SD40-2 detailing projects. Also picked up a recent Model Railroading (not Model Railroader) and had a neat little article about signal systems that made my mouth water. Picked up a Sabine River and Northern MDC box for about seven bucks…I remember seeing one on my Dad’s layout back in Cheyenne. Will need to look for some prototype photos as I thought they had white roofs, but mine is red (I think). Of late, as the track is laid for the staging yard, and the next tracks to be laid will be for the helixes winding up 8″ to 10″ to the main level, I have turned my attention to the numerous turnouts in the staging yard. Over Christmas, my son and I (as well as my mother-in-law and dear wife) visited Caboose Hobbies on a sunny winter day in Denver. While there, one of the things I picked up was a pair of Tortoise switch machines. I have had the switch machines tucked away in a drawer since then, waiting for the right time to crack them out and see how they will work. I debated on how to proceed with the staging yard, either using twin-coil machines sold as part of a turnout, or going the slow-motion stall type switch machine like the Tortoise model. Since I am looking for the staging yard to solid trackwork, I decided that wherever possible, I would use a Tortoise switch machine. The advantage is that once the switch machine throws the points, the motor stalls and holds the points tight. With a twin-coil machine, there is slack in the mechanism that can allow the points to float and potentially cause a derailment, especially in facing point scenarios. Almost two weeks ago I took the first one out of the box, and read through the directions. Simple enough…drill some holes, bend a wire, and mount the sucker under the turnout. The only problem…all my turnouts are laid, soldered, and attached to track that is glued down. However, one tiny little detail was missing…a hole under the turnout throwbar for the switch machine to attach to. Looking back, I should have realized this sooner, and I think at various times, I did consider it. However, I was more driven to get track laid and trains running then a little foresight to drill some holes before finalizing the turnouts. After some testing though, I should be ok. I have drilled a small hole a few mm away from the far extent of the throwbar from the top down. Then, I climb under the layout, slap on a larger drill bit, and slowly drill a few mm away from the first hole until I have bored through the plywood. Then a little bit of knife work to trim away some cork, and maybe some filing to open up the hole correctly, and I am in business. On Monday night, I made a mounting bracket for the switch machine consisting of small piece of plywood so I can drill a 1″ drywall screw through the bracket and into the layout sub-roadbed, keeping the drywall screw from protruding through the sub-roadbed. Then, after attaching the switch machine to the underside of the layout, I filed out the hole for the turnout throwbar, and then installed the linkage from the switch machine to the turnout. Then, I hooked up the power, and flipped the direction switch back and forth to test the turnout throw. After a little more filing, I am happy with the first install. The points are held tight again the rails, and I am looking forward to the ability to use some of the more advanced functions such as turnout indication, and hooking up with DCC to throw turnouts from a DCC throttle or a computer dispatcher display. I will throw up some pictures of the install when I get a chance, stay tuned. I cannot seem to figure out how I am going to run this blog, so with the lack of clear direction, I’ll just throw whatever I have at it in a hap-hazard manner, and see what happens. Good news is better than no news, right ? Over the past few weeks, I have been working on finishing up track laying in the staging yard. I started with the tracks nearest the walls, furthest away from my body, and worked inward. Awhile back, it was running the outer main lines around up against the wall. Then I worked along the north wall, and laid the secondary staging yard. 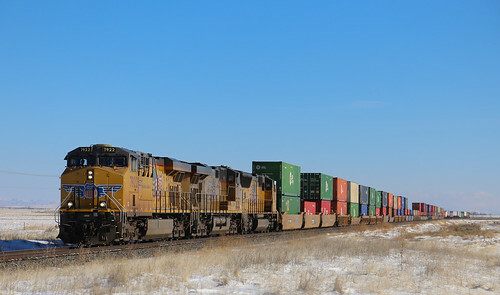 After finishing up both ends of that yard, it was on to the Denver staging yard, and connecting it into the west end staging yard interlocking. That left the main staging yard. Last year, I had started on the main staging yard by laying the east main staging ladder, and a few pieces of flextrack into each track. However, as this yard curves from the west to north wall, it becomes the near tracks, so I wanted to get the other trackwork out of the way to make the working environment more tolerable. So, after an order from ModelTrainStuff.com arrived about a month ago, I had enough supplies with the enclosed flextrack and turnouts to finally lay track for the main staging yard. A few weeks ago, I started working west along the west wall, but it took some time as the main staging yard is eight tracks wide. Eventually, I had everything laid, and this past week, I took the soldering iron and soldered rail joiners and feeders. Once that was complete, I sighted in and made sure the track was reasonably straight, and started gluing it down on Friday night. On Saturday, I was able to pull out the track nails, and after cleaning the glue off the rail, the first train rambled through. Today, I ran a few trains around, and did some switching. We pulled out Flossie’s Great Northern FT’s, and ran them around too, and ran they ran pretty well. After checking things out, and interacting with Tyler here and there. I started what will be one of the two last things left for the staging yard; installing switch machines. I pulled out one of my Tortoise switch machines and the drill, and worked on getting it installed on the first switch entering the ladder for the secondary and Denver staging yards on the east end. I was able to get it mounted and test the throw, powering it up with my powerpack, and letting the slow-motion stall motor do its thing. The test run went well, but I have to work on a mounting pad, and working on clearing out enough space for the throwbar. Only thirty-someodd of these things to wire install. I have some pictures and video of things, and will have to post at some point, stay tuned. Well, today marked a historic moment. No, it was not the first time the Cardinals have blown a game in Atlanta (see Saturday’s results for that). No, today, I packed up my kid in my trusty pickup, and we headed for the tracks. Worst case, we get down there and the kid hates it, and we trudge 15 miles back home. Best case, he loves it, and we have a great time. The result…somewhere in-between. On Sunday’s, Flossie usually takes a leave from Tyler for a few hours, going off to do various things and get some alone time without a diaper to change or kid to feed. We tried letting the dogs watch Tyler, but with the squirrel scenario, they get too involved with the rodent to keep their eyes on Tyler. With no grand-parent within a short drive, and the aunt off running around town on Sunday’s, this leaves only the Dad to care for the offspring. With the weather turning more like spring, and a pretty sky this afternoon, I figured I would kill two birds with one stone–get some fresh air for Tyler, and get in some railfanning for myself. So, after mowing the lawn and Tyler catching an afternoon snack, we loaded up the gear in the pickup and headed south toward the tracks. I was not really sure where I was going to go, as my old stand-by at Owyhee has been gated the past few times I have been down that way. But, I figured I trudge down somewhere east of Nampa, and see if I could find a place to park the pickup and wait for something to show up. I drove to an old spot I have driven past a few times, and decided to take a look at the access road. As it turns out, found a nice little spot out of the way to sit in the afternoon sun. 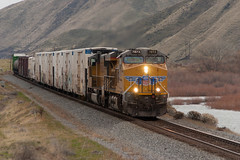 On our way down Eagle Road, we heard the scanner crackle…and the Nampa DS informed an EB he would take the siding at Kuna for 1, and that 1 was just rolling over the west switch at Owyhee. Oh Tyler…here we go. Luck was upon us, and we caught a nice string of highballs as we zipped down the highway, and shuffled over to Cloverdale Road and maintained highway speed. Twenty minutes later, we drove down the access road and setup the tripod. Soon, a whistle in the distance indicated the WB had cleared Kuna and the EB was out of Kuna and a few miles off. I got the video camera setup, then grabbed my son, decked out in his Wyoming cowboy hat to protect his noggin and eyes from the afternoon rays. Soon, the eastbound rumbled by, a nice set of power today with a SD70M on the point, a GE, then a non-turbocharged GP38 making a nice grumble as the trailing unit. If you check out the video link below, you will notice Tyler’s excitement as well about 70-75 seconds into the clip. It was a little quiet after the EB, and Tyler and I walked around the area, I showed him the rails, showed him the fence, showed him the dirt (did not let him play in it as much as he seemed interested), and showed him an airplane flying around. I had him back in the car trying to keep him entertained when a WB intermodal train snuck up on us. This guy has a SD70M on the headend (surprise surprise), and a Conrail GE trailing. I was going to share with Tyler some of my past days on Conrail, but after the westbound cleared, he became quite hungry. I had a bottle warmer with me, and tried to warm up a bottle for him. Alas, it was a failed enterprise today, and Tyler was not much for cool milk. So, he was a little grumpy (as you can see in the gallery of pictures below) for the next hour or so. 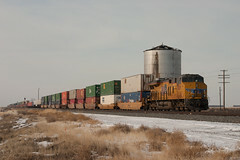 We stuck around for one more westbound, catching a manifest in the late afternoon. This time, I had enough time to get setup and drag Tyler out in my arms while snapping a few pictures. He was a good trooper again, and watched the various cars roll by. After the westbound cleared, we loaded up, and before I was back to the main road, Tyler was snoozing in his car seat. All in all, an enjoyable afternoon in southwest Idaho with my boy. The gallery from 03/30 shows work on the secondary staging yard, which was populated with all my rolling stock I own, unless it is sitting on the rip track on a few cars on display. Note the WB Rio Grande train getting underway (or shuffling around cars, I cannot quite remember what I was doing–it is an age thing). These views are work on the Denver staging area. 01703 shows work on the east end, and what the ladder looks like for the five staging tracks that make up the Denver staging. Then a couple of shots from the west end at various staging of construction. No pictures at the moment, but I did spend a little bit of time on the layout this weekend. Last weekend, I was able to get a majority of the Denver staging yard completed, after finishing up the secondary staging yard earlier in the month. If you check out this partial overview of the staging yard, the secondary staging yard is on the far left, and the Denver staging yard is the center group of tracks. Anyway, was back at it today, finishing up the Denver staging yard, soldering the feeder wires, and soldering some of the rail joints on the west end. All went well, and I was shoving cars into the yard and filling it up this evening while Atlanta and Philadelphia battled in a nice pitchers duel. Before bed this evening, I started laying out track for continuation of the main staging yard. This will be a larger task, as I have eight yard tracks, plus two main line tracks to lay along most of the west wall, and much of the north wall. When complete, each track will hold approximately 55-65 cars. As I near finishing up trackwork on the staging yard, there will be three tasks ahead. First, I will need to get all the wiring and power districts figured out. All feeder wires and soldering is done as I lay track, but hooking up all the wiring, and then gaping the rail and creating several power districts will follow. Then, I will have to embark on adding switch machines to the forty to fifty turnouts that make up the staging yard. Lastly, once most of the trackwork is done, I’ll need to make a run for some plywood to begin on the Archer helix.